Description:- Natrilix sr 1.5 mg tablet is used in fluid retention (edema), heart failure, increased blood pressure and kidney stone. 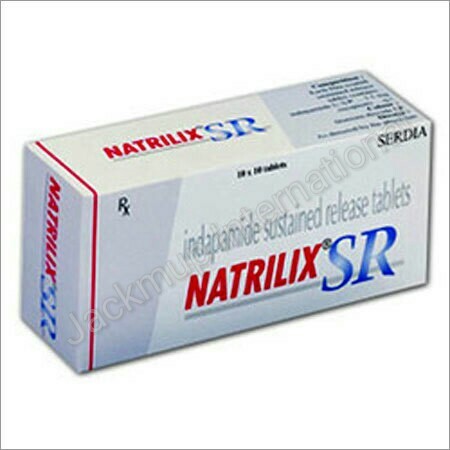 Natrilix sr 1.5 mg tablet lowers the blood pressure and swelling by removing extra water and electrolytes from the body. Do avoid excessive exposure to sunlight and wear sunscreen while taking indapamide. Indapamide should not be given to children or adolescent. Do not take indapamide tablets if you are allergic to indapamide, sulphonamide or any other ingredient of tablet. Do not take indapamide tablet if you have intolerance to some sugars. Do not take indapamide if you have severe liver disease, kidney disease or hepatic encephalopathy (abnormal brain function due to liver problems); low blood potassium level, heart problems, diabetes, or gout (pain and swelling of the small joints due to elevated levels of uric acid in the blood and subsequent deposition in the joints). Avoid using indapamide if you are pregnant or breast-feeding.